Make your “I do!” even more memorable with a beautiful wedding on the waters of Cape Cod aboard The Liberté this summer! What better way to make your big day memorable than with a sail aboard The Liberté? For couples who love their life by the water, a coastal ceremony and reception are perfect for a summer wedding. Make your “I do!” even more memorable with a beautiful wedding on the waters of Cape Cod aboard The Liberté this summer! Let the scenic peninsula of Cape Cod be the perfect backdrop for your special ceremony and reception. Available now until September 3rd, the Liberte can be your perfect wedding venue. Make the most special moment of your day even more memorable for you and your guests with a scenic backdrop of Cape Cod during your ceremony. Not only will your wedding be one to remember, but will also be able to capture these moments with a perfect backdrop in your photos. While many outdoor weddings are on the shore, nothing makes a seaside wedding more authentic than getting married on the water. Let your sailing venue provide you with all that you need for your big day! With beautiful scenery, the view and a gorgeous sunset become your most memorable accessories. Enjoy an unforgettable backdrop of the lighthouses and historic buildings of Cape Cod on a breezy summer day. Your wedding guests will never forget your special day with such a memorable and unique celebration on the water. Enjoy an intimate yet beautiful venue aboard The Liberté and share in the joys of your special day with your family and friends. While you make beautiful memories with your special guests, we handle the details such as your music and seating for your guests throughout the day. Unlike a seaside ceremony and reception on the shore, a wedding on The Liberté provides you with the perfect intimate setting for your ceremony and reception where so you can enjoy making special memories with your family and friends on the water. 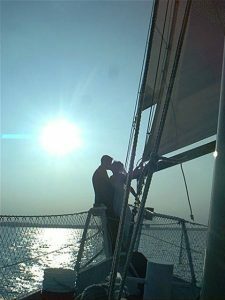 Enjoy Your Wedding in Cape Cod Aboard the Liberté! This entry was posted on Thursday, August 2nd, 2018 at 3:46 pm. Both comments and pings are currently closed.